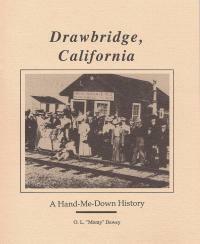 If you read the old newspaper accounts of Drawbridge, you will sometimes find it described in a derogatory way. Its residents did not agree, and the following story is an attempt to show the true picture of Drawbridge as told by the people who lived there. Now a ghost town sinking into San Francisco Bay.